These 350 objects are just the beginning. 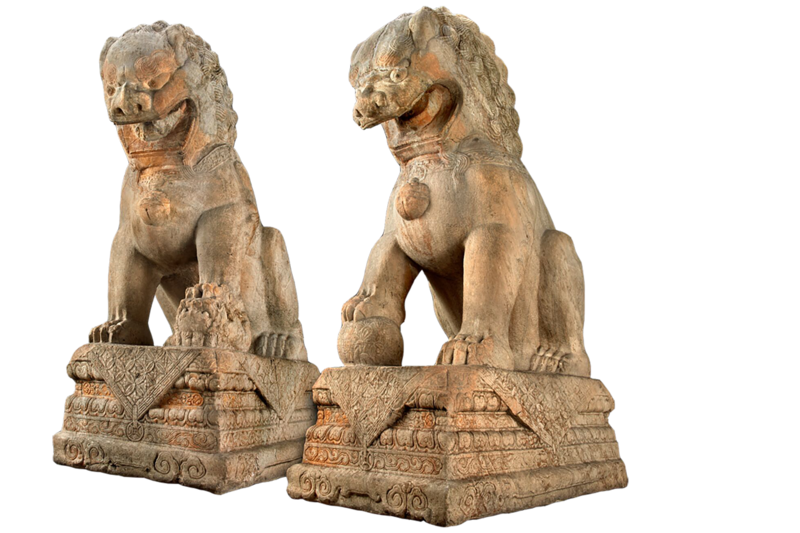 Walk between a pair of stone lions and enter a collection of rare textiles, rubbings, bronzes, and ceramics. These objects come together to tell the story of China, a land of diverse societies unified by shared traditions and a history of dynamic change. This Qing (ching) Dynasty silk robe features the two-horned, five-clawed dragon, traditionally used only by the emperor to acknowledge his special status as a link between human and supernatural worlds. Worn during theatrical performances, this 19th-century mask depicts Yang Ren, who, after being blinded, used a spell to create new eyes—resulting in a pair of tiny arms growing from his eye sockets with all-seeing eyes in the palms of the tiny hands. Take a closer look at objects that tell stories of China’s complex history, diverse cultures, and changing role in the world. Unwind in the Sue Ling Gin Garden, a peaceful space filled with eight spirit stones donated by the municipal government of Suzhou. There is no one China. People often think of China as monolithic, characterized by one land, one people, one culture. But there is no one China. In reality, China encompasses diverse landscapes, ethnicities, and social and lived experiences that cut across both space and time. The curators of the Cyrus Tang Hall of China assembled this collection to explore the intricacies of this vast country and its evolution over time: pottery and stone tools from Neolithic villages, bronze vessels and weapons dating back to the centuries of the warring states, painted scrolls depicting ordinary life, and goods traded along the Silk Road. Each object on display plays a role in telling China’s story. Together, these items examine the paradox of constant change and firm continuity that define more than 10,000 years of rich cultural history, from the Neolithic period to the present. The Cyrus Tang Hall of China is made possible with the generous support of the Cyrus Chung Ying Tang Foundation. Additional support provided by the William G. McGowan Charitable Fund in Memory of Sue Ling Gin-McGowan.